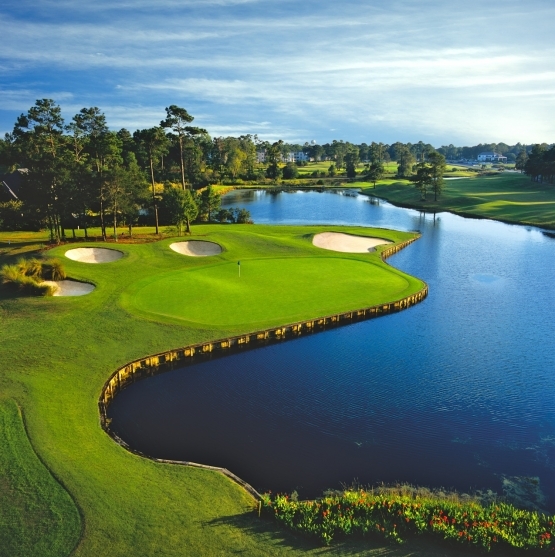 Sea Trail Plantation is made up of three Myrtle Beach championship golf courses and many believe that the Jones Course is its showcase layout. Renowned golf course architect, Rees Jones, designed a beauty with wide rolling fairways and scenic views. The par-72 layout features lush fairways that are surrounded by towering Carolina pines, natural and man-made water hazards, strategically placed bunkers, pot bunkers and Jones’ signature mounding. Water comes into play on 11 holes on this challenging, but fun course. The demanding par-3 5th hole requires a carry over water to a green fronted by a bulkhead and pot bunkers in the back. The course measures 6,761 yards from the blue tees, 6,334 from the whites, 5,716 from the gold and 4,912 from the red tees. The large undulating Bent Grass greens can be quite a challenge unto themselves. The Jones course has been a favorite among locals and tourists alike since its opening in 1990. Wild life is in abundance on this Myrtle Beach golf course with herons, ospreys, fox squirrels, fox, raccoons, and of course beware of the alligators. The Sea Trail Jones Course is located in Sunset Beach, North Carolina and would be a perfect course to include in a Myrtle Beach Golf Authority golf package. Only a short drive from North Myrtle Beach you can stay in any of the outstanding North Myrtle Beach hotels, condos or ocean front beach houses that are offered by Myrtle Beach Golf Authority. While visiting North Myrtle Beach be sure to check out the wonderful North Myrtle Beach golf retail outlets such as the PGA Tour Superstore or GolfSmith. They offer the latest in golf equipment such as Titleist, Ping, Callaway and TaylorMade. Their wide selection of golf apparel will ensure that you look your finest on the Myrtle Beach golf courses. Book your Myrtle Beach golf package today!